Ask Engadget HD: Best way to record TV on my PC? Fans of wireless audio will be able to pick up Able Planet's first over-the-head Bluetooth headset in Q3 of this year. Dubbed, BT500, this Bluetooth stereo headset sports a supra-aural design with a 40mm transducers. There's a directional microphone and a battery compartment for two AAAs housed within the left earcup, which will keep the cans running for eight to ten hours. On the outside of the right cup, you'll find a quartet of playback and syncing controls. The buttons are placed in an intuitive layout, but the button feel was rather hollow -- thankfully, we're told that the buttons will be improved before shipping. When it comes to the fit we really couldn't complain. To put it simply, the headphones felt light and well balanced, and the memory foam filled faux-leather pads countered to our ears nicely. We couldn't test sound, but if the final unit sounds as good as they felt, we think that the $150 asking price will be more than fair for the overall package. Notably, we're told an RF-based variant is slated for Q4. 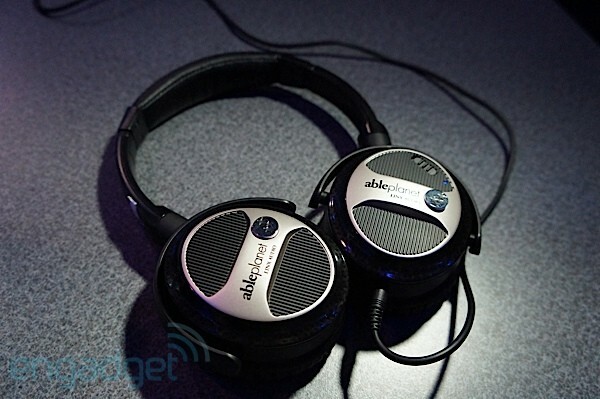 Next up, Able Planet also let us in on its NC1200 noise-cancelling headphones. While the company is well known for circum-aural, ANC cans, we're told that is the first time its ever produced a surpa-aural variant. 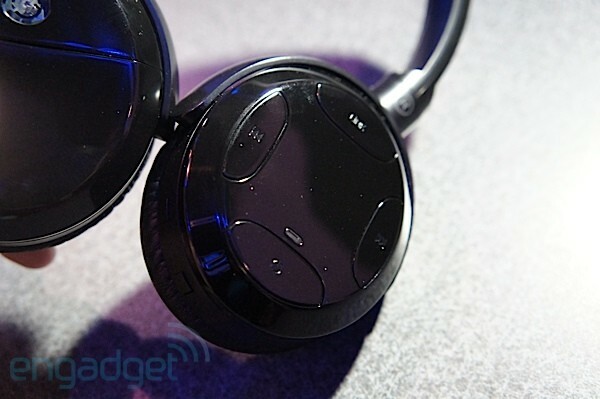 The headphones feature a detachable 3.5mm cable, and a MicroUSB connection for charging a built-in battery pack. There's no word battery life, but Able Planet is hoping to land somewhere between 50 and 100 hours of playback time. The NC1200's fit was pleasantly similar to the BT500, leaving us with no initial concerns for extended-listening comfort. We briefly demoed some tracks of of Weezer's "Green album," and found the voicing of the headphones to be bright and clear -- the use of vibrato in Rivers Cuomo's vocals were especially intelligible, as were the guitars and cymbals. The bass sections were also perceptible, but if you like an added amount of oomph, we're not sure that these would be the ones for you. Also worth note, while the headphones can be used sans' power, the audio quality was terribly muddy once the ANC was turned out. The NC1200's are set to sell for $350 once they hit shelves, and you can be sure that we'll keep you posted when both it and the BT500 start shipping to retailers. For now, keep it posted to our CES coverage for even more audio-wares, and check out the gallery above for even more up-close-and-personal shots with this ear-gear.